We have all went to grab for our favorite electronic only to receive that sinking feeling that something has gone terribly wrong with it. I have that problem with my iPod at the moment and if it turns out not to be fixable then I would hope to find something like this clock to make sure that it stays usable even after its prime has passed. Sure, this is an incredibly dorky way to check the time, but at least it temporarily keeps one electronic from rotting away in the local dump. The iPod has had a clock inserted into it that uses a USA made quartz drive movement. The whole thing measures 2.5” wide by 6.5” tall. In order to keep it up and running you’ll just need one simple AA battery. Also if you should want something of yours turned into a clock, you can always contact them to work out a deal. This particular device will cost you $39 through Etsy. 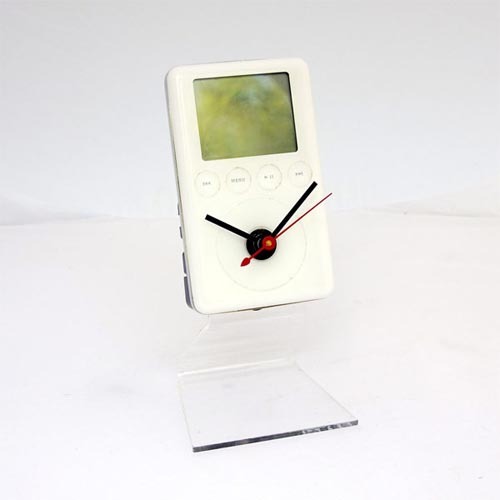 $39 for a recycled iPod wanna-be clock? How lame is this? This is cool if you do it yourself but to pay that price for just a clock that was once an iPod is ridiculous. Lets turn my old Chevy pickup into a giant paperweight and sell it on ebay for $1,000 ton rustic upbeat style product… See how stupid that is? What stupidity will people create next and actually try to sell as a novelty item, umm maybe turning hen eggs into art sculptures lmao!